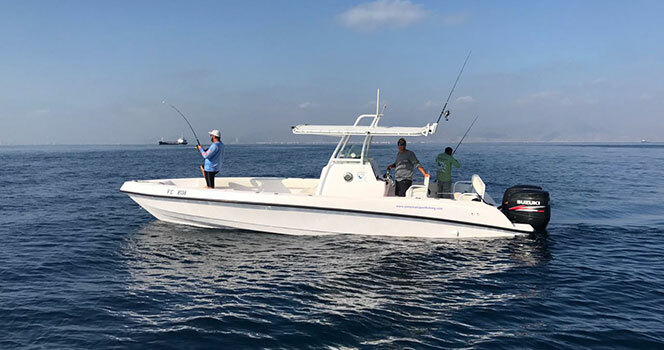 Our boats are custom built 32 to 39 feet and specifically designed and geared up for professional sport fishing in comfort off Fujairah. There is comfortable seating, ample shade, open deck space for casting and fighting fish and an onboard toilet. Our boats are registered commercially as per Fujairah UAE Laws and are fully insured along with passenger insurance. Standard emergency equipment include but not limited to First Aid Kit, Life Jackets, VHF and Thuraya Sat Phone. Our South African captains are experienced and hold an internationally recognised commercially endorsed offshore captains license along with STCW certification. Yellowfin 1 is a 32-foot centre console boat designed by fishermen for Fishermen. She is perfect for up to 4 anglers. She is equipped with state of the art Lowrance electronics, and radar components. She has a 50 Gallons live baitwell and is further equipped with a toilet, seating, padded gunnels and shaded T-Top. First Aid kit, life Jackets, VHF and Thuraya Phone are available on board. 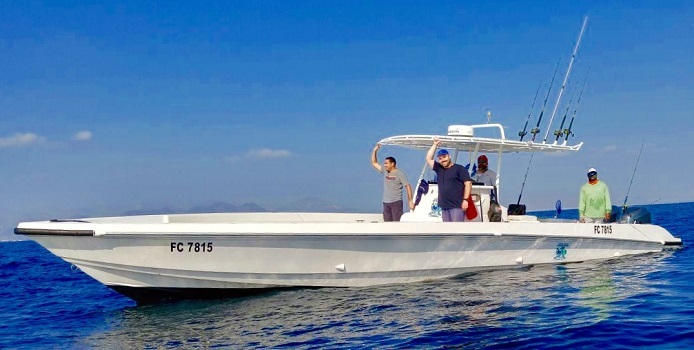 Yellowfin 1 is fitted with twin 175 Hp Suzuki Four Stroke engines and is capable of speeds of up to 43 knots. Yellowfin 2 is the big brother of Yellowfin. She is a 38 Foot Centre Console custom built speed boat that can carry up to 7 anglers in comfort. She is fitted with the latest state of the art Garmin touch screen electronics and navigation which includes Broadband 3G Radar and deep water Depth sounding technology. She also carries a 50 Gallon Live Baitwell, toilet facilities, 50 Gallon Fresh Water Tank, ample seating and shaded T-Top. Yellowfin 2 is fitted with twin 225 Hp Suzuki Four Stroke engines and is capable of speeds of up to 40 knots. Yellowfin 3 is almost identical to Yellowfin 2. She is a 38ft centre console custom designed to our needs and built by Ocean Boats UAE. Extremely seaworthy and functional, Yellowfin 3 is powered by twin 250 Yamaha 4-stroke outboards and is capable of speeds up to 40 knots. Yellowfin 3 is equipped with dual live-bait tanks, Garmin electronics as well as the necessary safety equipment. She is very spacious and can accommodate up to 7 anglers with ease. With comfort elements such as a generous T-Top and an on-board toilet, she is perfect for a full pleasurable day on the water. 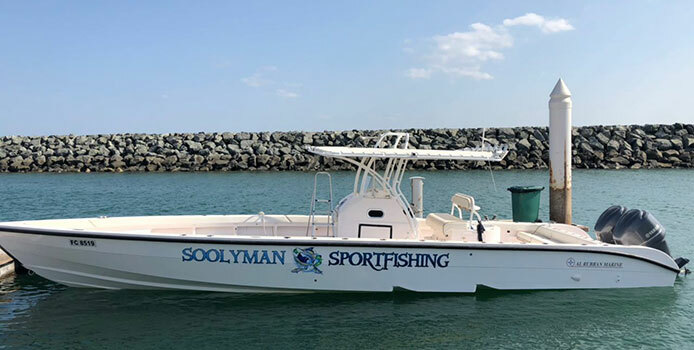 Yellowfin 4 is our latest addition to to the Soolyman Fleet. She is a 39 Foot Al Rubban Centre Console custom built speedboat that can carry up to 7 anglers in comfort. She is fitted with a Garmin Chartplotter and a dual Chirp Transducer. She also carries a dual 50 Gallon Live Baitwell, toilet facilities, 50 Gallon Fresh Water Tank, ample seating and a shaded T-Top. Yellowfin 4 is fitted with twin 250 Hp Yamaha Stroke engines and is capable of a range of 450 Nautical miles. Our tackle consists of only the best Shimano Tiagra/TLD/Saragosa/Stella and Penn International multiplier and spinning reels. We have light action, medium action, and heavy action tackle to go with every angler and every situation. We also have both Monofilament and Braided lines from 30 pounds up to 80 pounds. We are proudly sponsored by Pulsator lures from South Africa and fish their full range of high-quality handmade fishing lures.